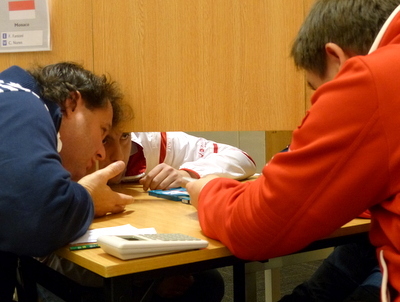 China Wins World Mind Games Pair Go Tournament; Meeting the Masters; Do Bridge Players Have All The Fun? China’s Chenxing Wang 5P and Ruiyang Zhou 9P (left) defeated Chinese Taipei’s Joanne Missingham 6P and Yuan-Jyun Wang 6P on Wednesday to win gold in the SportAccord World Mind Games (SAWMG) Pair Go competition. 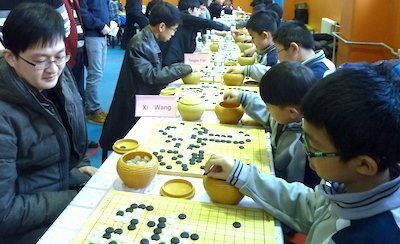 The 3-round event capped the third annual SAWMG competition, which included men’s team and women’s individual events in go, as well as competitions in chess, bridge, draughts and Chinese Chess, and ran December 12-18 in Beijing, China. The bronze medal was won by Park Jieun and Kim Jiseok, the pair from Korea. Click here for full go coverage on Ranka Online, complete event coverage on the SportAccord World Mind Games website – including video commentaries by Michael Redmond 9P on the SAWMG YouTube channel — and of course on the usgo.org website. Coverage this year included audio commentaries by Redmond on KGS; check KGS Plus under Recent Lectures. Round 1 (12/16): Europe (Kovaleva-Fan)-China; Korea-North America; Europe (Shikshin-Shikshina)-Japan; Chinese Taipei-Europe (Burdakova-Lisi). Round 2 (12/16): Europe (Burdakova-Lisi)- North America; China-Japan (Redmond commentary); Europe (Shikshin-Shikshina)- Europe (Burdakova-Lisi); Chinese Taipei-Korea. Round 3 (12/17): China-Chinese Taipei (Redmond commentary); Japan-Korea; Europe (Burdakova-Lisi)-Europe (Shikshina-Shikshin). Meeting the Masters: Students at the Huajiadi Experimental Primary School in Beijing got a chance to meet some of the SportAccord World Mind Games’ top go players and officials on Tuesday. The school is known for its cutting-edge approach to teaching and boasts nearly a thousand junior grade go players. The guests were greeted by two rooms of children buzzing with excitement. In the first classroom, a hands-on lesson on nakade grabbed the children’s attention, and in the second the pupils quickly settled down and answered questions about the history and rules of the game. The guests were then taken downstairs to the gymnasium, where boards had been set out for the 40 kids who would take on top professionals in nine-stone handicap games….click here for complete report.